Big Boot to the Backside | Less. More. Abundantly. 12 weeks ago I sprained my ankle. I doctored it myself. “What would the doctor tell me to do I didn’t already know?” I thought. Unfortunately, I re-injured it. Like tree sap flowing down the side of a pine tree in winter, I slowly continued to tear apart my ankle by walking on it. Finally I went to the doctor when I couldn’t bear weight on it. MRI was nasty. To me it looks like I have spaghetti instead of muscles in my ankle. Vertical split tear…partial interstitial tear…tenosynovitis…inflammation into the bone…that, dear one, is one class A, super-stupendous ankle injury. Now I have been told there is a s-l-i-m chance I can avoid surgery if I am ‘compliant’ and don’t walk on it. I have a boot cast which I’m allowed to remove for the shower only. Now I am stuck in the middle of having a very busy life and not being able to move through it, save for crutches and a wheelchair. Coincidentally, I have embraced a new way of eating and have lost 10 pounds. I couldn’t wait to ‘heal up’ so I could add exercise to my new commitment to health. Cue flushing noise as all of that goes down the toilet. This past weekend we celebrated Thanksgiving in New York City. We borrowed a wheelchair from church. While my husband braved frozen rain and sleep deprivation to share the parade with the children, I was on the couch in the apartment. Depression settled on my shoulders like a heavy, wet, cold blanket. 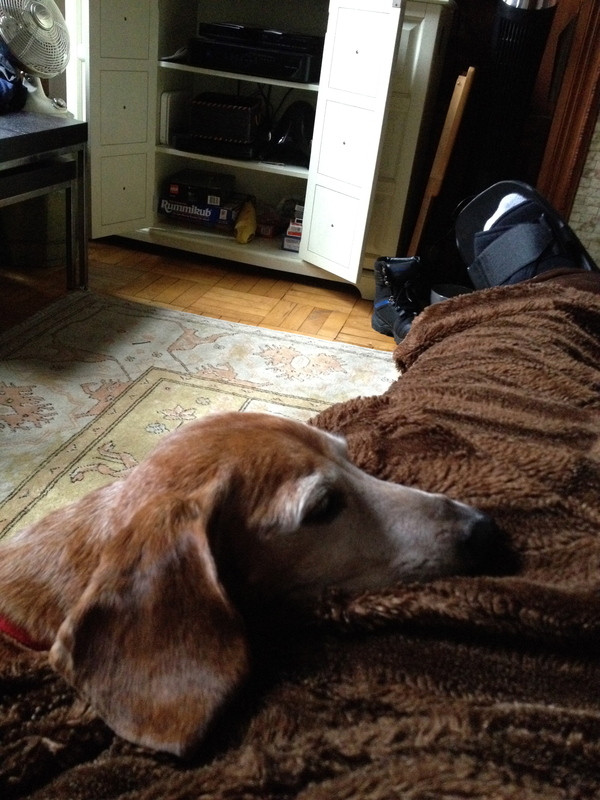 My Doxie was my companion for bad movies and endless napping. I put on a brave face as my husband hefted me through Manhattan. 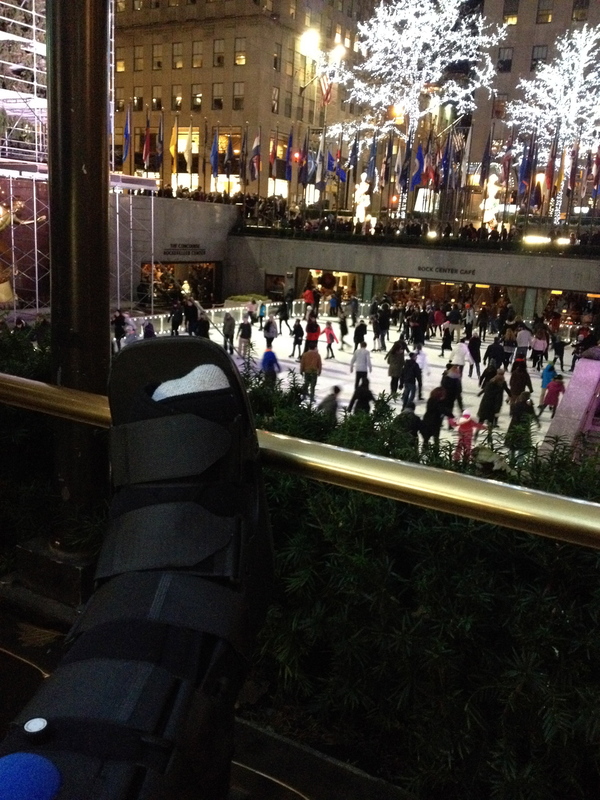 I even managed a smile for the lovely Scottish tourists who chatted me up whilst the kids skated Rockefeller Center. As they ‘parked’ me in various corners to get coffee, I attempted to shrug off my all too familiar companion-failure. Of course I wouldn’t be able to continue the eat less part of this journey. How could I? Four slices of Ray’s pizza and three diet cokes later, I fell into a carb, fat, sugary slumber as the car made its way home. I have a choice. I can, once again, do what I have always done and give in. I can agree with the destructive self-talk of defeat, blame and pain (physical AND emotional). 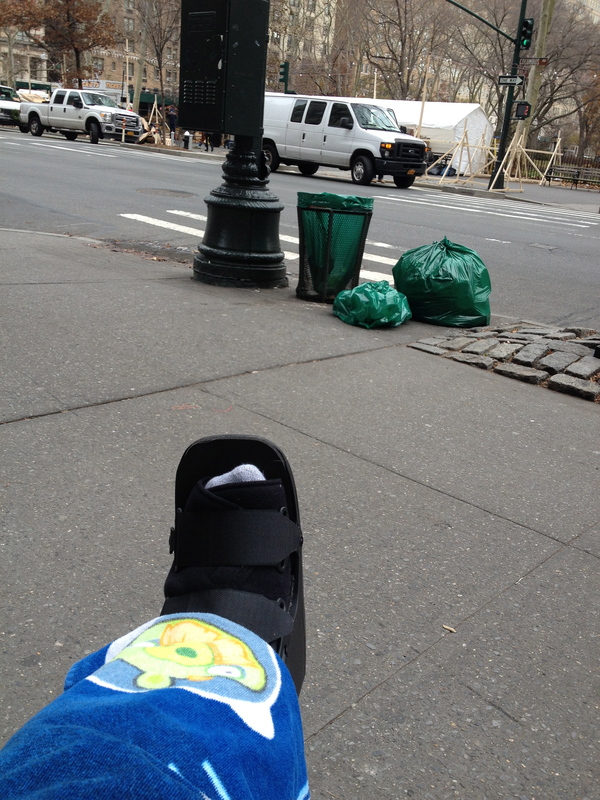 Or I can take this boot into the backside to push me forward. The boulders in front of me are HUGE. I have to trust those in my life to care for me when I barely know how to care for myself. I have to stay committed to filling my plate and my heart with good things. I have to choose, minute by minute, not to give up. I have to stand up to the challenges before me and decide to go through, over or around because standing still is no longer an option. So, in what areas of your life is standing still no longer an option? Share in the comments. We can climb the boulders together! Ain’t No Mountain High Enough to Keep Me from Me! So, the boulder looks like a resume’ or an interview? Let’s do this! I’m a good one for resume’ reviews if you need fresh eyes. I also have a team of workforce development peeps, one of whom is amazing when it comes to resumes’. Can’t wait to see who is smart enough to hire a spitfire like you! How about the plan where I’ll write in the morning, no wait–by lunch, no wait–after lunch, no wait–after dinner, no wait–tonight, no wait–instead of sleeping, no wait–definitely tomorrow, definitely! Or how about the old, “I’ll start eating raw foods again tomorrow, oh wait–I didn’t mean this tomorrow, I meant the next tomorrow.” Do you see where this is going? Do you? Dooo youuuu? Nowhere? Exactly! 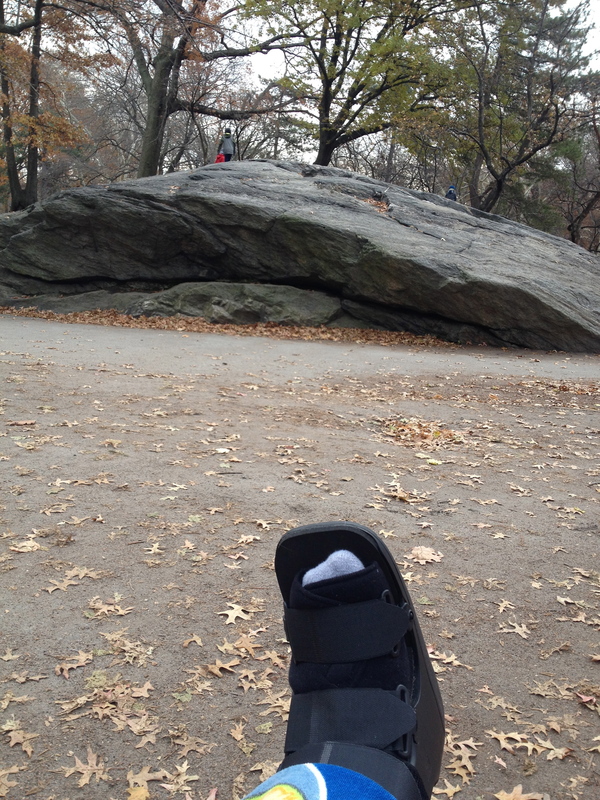 I love the boot in all your pictures, and I’m so sorry that your ankle is so shoddy right now! Having other people take care of me feels like the worst kind of torture. I don’t like needing other people, and I certainly don’t like the sidelines, so I know that was a difficult weekend for you! I’m sorry, KimRo. As far as food for comfort, I’m fighting that battle with you, sister. Seriously. “Having other people take care of me feels like the worst kind of torture.” Sounds so much like your Bianca, huh? Truly it is a kind of torture and a level of vulnerability that I am not comfortable with AT ALL. Today I ate clean…except for a tiny nip of chocolate and a sip of coke…feeling again the hangover from departing from my formerly clean ways. We can fight the battle together! Glad you are in the trenches with me.